Oh my gosh, I can't tell jokes to save my life. I either can't tell it right or I forget the punchline. Also, a lot of jokes nowadays are just gross. I'm down for the dirty-funny, but not the disgusting funny. 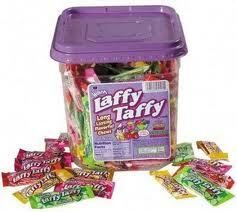 I can't really remember any childhood jokes, but I do remember always reading the jokes on the Laffy Taffy wrappers. They're unbelievably corny, but kids love them. Q: What kind of bear has no teeth? Q: Where does the general put his armies? A: When there is change in the weather. A: Saturday and Sunday. Every other day is a weekday. Q: What did the finger say to the thumb? A: I'm in glove with you. A: Because she saw the salad dressing! Q: Why didn't the teddy bear finish his supper? A: Because he was already stuffed. Q: How do you fix a broken jack o'lantern? A: You use a pumpkin patch. Q: How do you get a peanut to laugh? A: You crack it up. Q: What do you call a broken window? A: A pain in the glass.